Lawyer, writer and women’s rights advocate Rafia Zakaria will present a lecture, “Drones and Terrorism: The Ultimate Miscalculation,” on Monday, September 23, at 7 p.m. in the Robinson Teaching Theatre in Weyerhaeuser Hall at Whitworth University. For more information, please call (509) 777-4937. 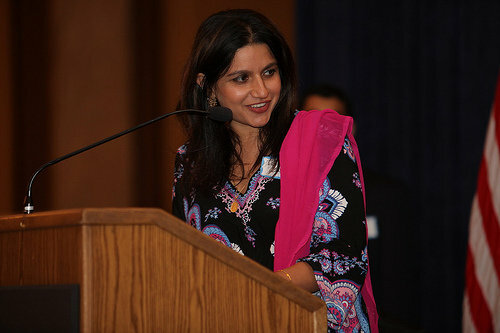 Zakaria is the first Pakistani American woman to serve as the director of Amnesty International USA. She also founded the Muslim Women’s Legal Defense Fund for the Muslim Alliance of Indiana/The Julian Center Shelter, which represents victims of domestic violence. In addition to being a lawyer, Zakaria is a columnist for Pakistan’s largest English newspaper Dawn, and she is pursuing a Ph.D. in political science at Indiana University. For the 2007-2008 academic year, she was named the John H. Edwards Fellow, which is the highest academic honor bestowed on a graduate student by Indiana University. Zakaria is the only Pakistani American woman recognized by a joint resolution of the Indiana House and Senate for her work on women's rights. Stephanee Newman, sociology and political science program assistant, Whitworth University, (509) 777-3834 or snewman@whitworth.edu.